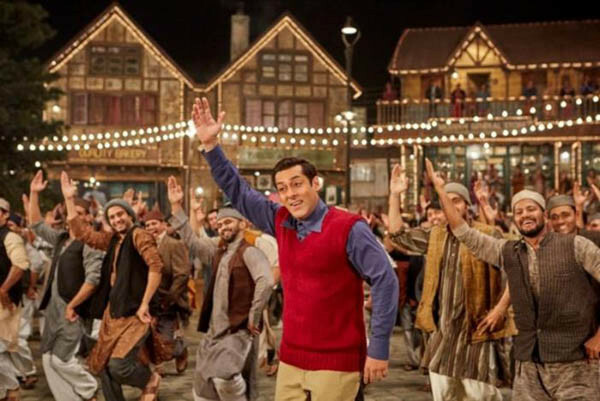 India’s most successful movie star is almost unrecognisable in “Tubelight”. Salman Khan has come a long way from the days of bare-chested fight sequences and gyrating dance numbers – a combination that brought him some of his biggest hits and sent legions of his fans into rapture. In Kabir Khan’s drama, this one-time all-conquering hero has morphed into a bumbling dimwit who bursts into tears at the slightest provocation and can barely land a blow on the bad guys. Khan plays Laxman Singh Bisht, a character that is a strange combination of Hrithik Roshan in “Koi Mil Gaya” and Shah Rukh Khan in “My Name is Khan”. Laxman is good-natured but slow-witted and spends all his time cavorting on the hillside with his beloved brother Bharat (Sohail Khan) and imbibing lessons in “yakeen” (faith) from a visiting Mahatma Gandhi. Good-natured villagers and benevolent guardian Banne Chacha (Om Puri) ensure that Laxman goes through life without too many hurdles, but his idyll is shattered by the 1962 war between India and China. The army comes calling for all able-bodied youth to sign up, and Bharat answers the call of duty. Rudderless without his confidant, Laxman finds solace in Guo, the precocious new kid in town. Guo and his mother Li Ling (Chinese actress Zhu Zhu) are second-generation Chinese immigrants who find themselves at the receiving end of hostilities because of the war, but Laxman extends his friendship to the duo, remembering what Banne Chacha had told him – peace can only be achieved if you make friends with the enemy. Adapted from the 2015 Hollywood film “Little Boy”, “Tubelight” is a mostly faithful translation. But at 150 minutes, the film overstretches its run-time by more than half an hour. Director Kabir Khan makes a few relevant points about inclusivity and the growing extremism in today’s society, but he makes the mistake of thinking the audience is as slow on the uptake as his hero is. It feels like the director is spelling out his message, pronouncing it slowly and loudly so that everyone can get it. After a point, it gets tiring. Khan’s Forrest Gump act doesn’t help either, nor does his constant reference to yakeen (faith) and his belief that he can literally move mountains with it (including several scenes where Khan crouches with his hands stretched forward and concentrates on a far-off mountain to try and move it with his will). The rambling screenplay (credited to Kabir Khan and Parveez Shaika) doesn’t seem to have a focal point, Khan’s do-gooder act gets old fast, and you can see the end coming from a mile away. Matin Rey Tangu, who plays Guo, is a ray of sunshine in an otherwise bleak cast. But even his scenes with Khan feel superficial, almost as if they were trying to duplicate the “Bajrangi Bhaijaan” chemistry between Khan and the child actor in that film, Harshaali Malhotra. For all its insistence on faith, the film shows a surprising lack of it – it is all rehearsed, clumsily designed to tug at the heartstrings and endear us to its leading man. This “Tubelight” flickers erratically for a long time and then dies out.